In 2015, the European Food Information Council (EUFIC) celebrates 20 years of achievements as a balanced source of science-based information in the area of nutrition and health, food safety and quality, and consumer insights. For 20 years, EUFIC has helped consumers to be better informed when choosing a well-balanced, safe and healthful diet and lifestyle. What started in 1995 with one person and no online presence, twenty years later has become a respected non-profit organisation with over a dozen staff and a website that attracts over 13.6 million visitor sessions per year. More than 47,000 persons are subscribed to EUFIC’s electronic newsletter, and EUFIC today is a credible and sought after communications partner in multi-stakeholder platforms and EU-funded projects. Information that EUFIC publishes is subject to a review process by members of its Scientific Advisory Board (SAB), a group of renowned experts from across Europe who advise EUFIC on its information and communication programmemes, ensuring that all information is based on scientific evidence. EUFIC is supported by companies of the European food and drinks industries, and receives project funding from the European Commission. All members subscribe to EUFIC's transparency statement. Can you share your views about some of the challenges and opportunities your organisation faces? EUFIC’s greatest challenge is to communicate science based information in a way that can be understood and trusted by a general audience. It is a challenge because we address consumers, media and professionals, but we also know that our materials can be used by nutrition and food policy experts and consumer groups in debates about health intervention strategies for entire populations. It is therefore a challenge and a responsibility. We must ensure that what we communicate has the backing of the scientific community, academics, nutritionists and dietitians, health professionals, but also parents, teachers and elected officials. Given the broad range of subjects addressed in EUFIC’s popular newsletter, Food Today, a dedicated Editorial Board for this publication provides additional insights and feedback. We have collaborated with as many as 190 partners in EU-funded projects over the years, so developing and strengthening partnerships remains a significant opportunity for us as we turn our attention to the next 20 years helping consumers choose healthy diets and lifestyles in the future. Our approach to consumer insights specifically, remains a pillar of our recognised credibility among professional stakeholders: we were entrusted to coordinate the EU-funded FLABEL project on nutrition labelling from 2008 to 2012 and then entrusted again to coordinate the ongoing CLYMBOL project on health claims. With an established reputation among professionals, the current opportunity and challenge is to leverage our entry into social media to become even more relevant and accessible to broad consumer audiences. Can you tell us about the events your organise? EUFIC organises and supports scientific symposia at important international events, such as the International Congress of Nutrition (ICN) where we attracted over 1,300 delegates to scientific sessions on healthy diets and EU-funded projects. Since we coordinate communication activities and stakeholder involvement for many EU-funded projects in which we participate, we could organise around five to ten events per year in Europe, including stakeholder workshops and final conferences. The stakeholder workshops are designed to gather stakeholder views and discuss with them specific aspects of the project, whereas final conferences aim at disseminating main results produced by EU projects. Recently, we organised the EuroDISH final conference for example, which was held in May at the EU Pavilion of the World Expo in Milan. We also now organise an annual stakeholder event that coincides with our association’s annual general meeting, which this June attracted more than 70 participating stakeholders. What is the association's decision process concerning the events you organise? Since our events are quite specific in terms of food and health issues, and most often targeted to a scientific community, we have an ad hoc approach to each one. For EU-funded projects, the decision on the type of final conference is taken together with the project coordinator, usually an academic institution and involves the consortium. Generally speaking, the events will be in Europe, and destinations are decided according to an informal process that involve criteria such as nationality or location of key participants, relevance of the venue to the issue discussed, cost of travel and accommodation, and access to attractive activities outside the scientific programme. What has the most memorable event been so far? Why? As a contributor to the scientific community, we place great importance in a conference organiser’s ability to support our requirement to focus on high added value content and peer exchanges. We must know that our workshops, roundtables, discussion panels and scientific symposia will benefit from the best possible conditions: appropriately sized conference halls, breakout space, audio/visual quality and comfortable environment in which to work, debate and exchange among professionals. 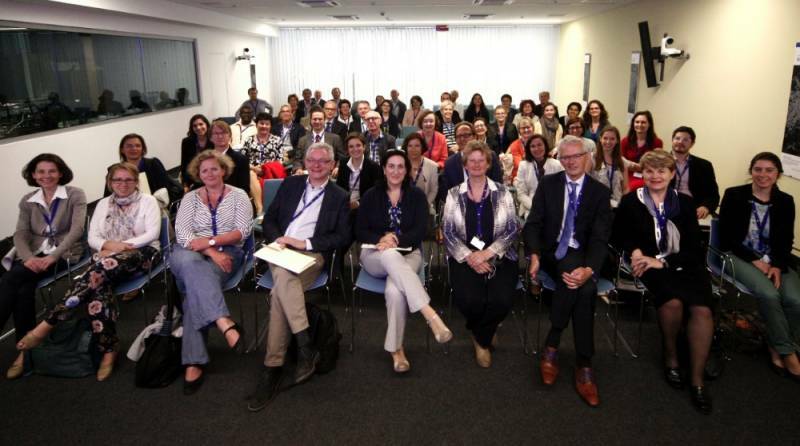 We have fond recollections of the International Congress of Nutrition (ICN) in Grenada in September 2013 and the European Federation of the Associations of Dietitians (EFAD) Annual Conference in Athens in October 2014. Where we see opportunities for added value when choosing a destination, we look to conference locations that can propose top notch conditions for the conference-related work, and offer varied activities outside congress hours. So first, we look at the quality of the venue for delivering scientific symposia; then we ask ourselves, will the exhibitor space be easily accessible and comfortable and attractive to participants, and will the catering support a networking environment to permit quality exchanges with peers? We have heard from our community that opportunities offered to conduct local tourism and varied activities outside of the conference venue is always well appreciated by participants.